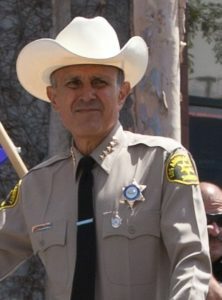 A jury has found former Los Angeles County Sheriff Lee Baca guilty of three felonies pertaining to a scheme to impede a federal investigation into corruption and civil rights abuses at county jail facilities. Baca is now facing a likely prison sentence. The scheme to thwart the federal investigation allegedly began in Aug. 2011, when deputies recovered a cell phone from an inmate at the Los Angeles Men’s Central Jail, linked the phone to the FBI and determined the inmate was an informant who was cooperating in a corruption and civil rights investigation. The phone was given to the inmate by a corrupt deputy, who subsequently pleaded guilty to federal bribery charges. As part of the obstruction scheme, Baca ordered a criminal investigation into FBI agents and directed deputies to conceal the informant from federal investigators, United States prosecutors argued. Members of the conspiracy also engaged in witness tampering in an effort to prevent information from being shared with federal authorities and threatened to arrest the lead FBI agent on the case. Baca placed his right-hand man, then-undersheriff Paul Tanaka in charge of the scheme, but the former sheriff participated in dozens of meetings and phone calls with co-conspirators and admitted to directing his deputies to approach the FBI agent, federal prosecutors said. Last December, a mistrial was declared in Baca’s case after the jury deadlocked 11-1 in favor of acquittal. Federal prosecutors then retried Baca, and on Wednesday, the second jury found him guilty of obstruction of justice, conspiracy and making false statements to federal investigators. Following Baca’s conviction, the federal investigation in to LA County jail facilities has resulted in a total of 21 convictions. Ten former members of the sheriff’s department have been convicted in the obstruction scheme, and 11 former deputies have been convicted of charges mostly related to unprovoked beatings of inmates and subsequent cover-ups. Baca, 74, is facing a maximum sentence of 20 years in federal prison. Am I the only one who sees a disconnect here? A local government official interferes with federal authorities and gets jail time. Yet local government officials interfere and obstruct federal immigration laws and are praised as heroes. The system is definitely broken. If someone the size of Baca can be legitimately taken down, maybe there is some hope? He may get a few years in jail but don’t worry his pension will stay intact. Public officials should get at least double the penalty we get. Usually they walk and we serve time. I’m all for bringing back 1600’s-style public shamings, too. Seriously. I think there would be quite a bit of deterrent power in making people have to sit in stocks in the town square for a few weeks while citizens jeer at them a bit.—Humanely of course. Nobody enjoys a pity party. I’m thinking perhaps they should have to dress up like a clown and perform tricks for kids or sit for a dollar-per-ball dunk tank until their debt to society is paid off. And in SLO county, people who abuse their position get a giant bonus before they walk.